*) The following information may be revised without any prior notice. Please check for updates at Immigration of Indonesia Official Website. Nationals of the Republic of Indonesia and nationals of the People’s Republic of Bangladesh, holding valid diplomatic or service/official passport, shall not be required to obtain a visa to enter, transit and stay in the territory of either Country for a period which does not exceed 30 (thirty) days from the date of entry. *) The following information may be revised without any prior notice. 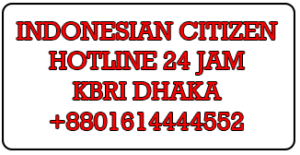 Please check for updates at Immigration of Indonesia Official Website. Delivery of the visa are 3 working days. No additional / extra fees.